The Wrestler has won the coveted Golden Lion for best picture at the Venice film festival. 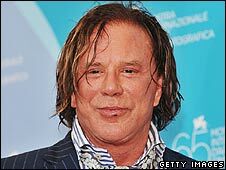 The film stars Mickey Rourke as a has-been professional wrestler pitifully loath to throw in the towel. It marks Rourke's return from acting obscurity. The Silver Lion for best director was won by Russia's Alexei German Jr for Paper Soldier. Italy's Silvio Orlando and Dominique Blanc were winners in the best male and female categories respectively. Orlando starred in Il Papa di Giovanna and Blanc was in L'Autre. The Wrestler, directed by Darren Aronofsky, drew praise from critics and the public alike. "I need to thank Mickey Rourke, for opening up his heart and soul for the camera, for trusting me and giving me the honour of reminding the world what a great talent he is," Aronofsky said after receiving the award. Rourke congratulated the jury on making "the right decision". "Darren could make other kind of movies if he wanted to, make a lot of money in the United States," Rourke said. "I love and respect him because he doesn't compromise and he wants to make movies that are not that expensive, that have a lot of integrity." Jury chair Wim Wenders said Rourke put in a "a truly heartbreaking performance". The 11-day cinema showcase has been under fire for what some critics said was a generally weak selection of 21 films in the main competition. It is often perceived as the unofficial start of the long run-in to the Oscars the following year, where Rourke is widely expected to be nominated in the best actor category.